Anything on this card look familiar to you? If you immediately thought, hey, that's Susie's little ATC from yesterday, you are right!! Ding ding ding!! You're the winner! Go eat a cookie. Yep, yesterday, I still needed to make a card for today for Jen's Sketch For You To Try (as I do every Saturday! ), and when I saw the sketch, I knew the ATC would be a perfect match for it, plus, I knew I wanted to turn it into a card eventually. So, presto, chango, my little ATC is now a full-grown card (they grow up so fast!). The details on this card are pretty straightforward. It's been a long week and I'm going to take it easy today (after the laundry, a birthday party and some shopping), so I will leave you to gaze at the eye candy of this card and all my other (simply the best) friends---Amy S., Amy R., Carole, and Shannan--be sure and see what Jessie created on Jen's blog, too (that's where the sketch is as well, just fyi..). Play along with us and upload to SCS using keyword SFYTT! I hope to see ya'll soon around these parts as I have a lot of cards to catch you up on! TIP: Make little tabs with the word window punch and fold them over a layer instead of just cutting them off at the edge. It makes for a neater look overall. This is a great ATC turned card. I love the colors and that stamp set. Have a good weekend! Great card! 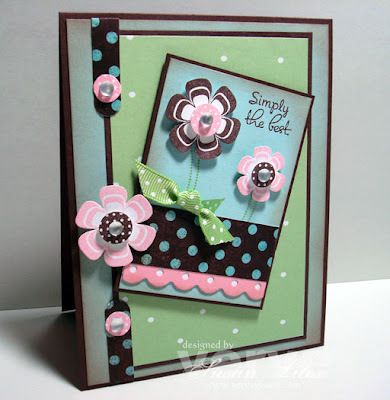 Love how you turned your ATC into a full-size card..and this sketch looks really fun! This is darling! I loved your comment about how "they grow up so fast"! LOL! I am in my first ATC swap right now and this is certainly inspiriational! Thanks girl! What a darling card! And thanks so much for the cookie - it was yumm, HA! Love how you made the ATC into a card! Love it!! hey - congrats on becoming a principal! I read it on SCS, but never said anything! Good luck! Your ATC is looking so spiffy all grown up!! Great card!! This is fantastic, I love it! !